A PICC is a long, thin, flexible tube known as a catheter. It is inserted into one of the veins in the arm just above the bend of the elbow. It is then pushed into the vein until the tip sits in the large vein just near to the entrance to the heart. The other end is taped securely to your upper arm. You can go home with the PICC in and it can be left in for weeks or months. It can be used to give you your treatments and to take blood tests. How is the PICC put in? 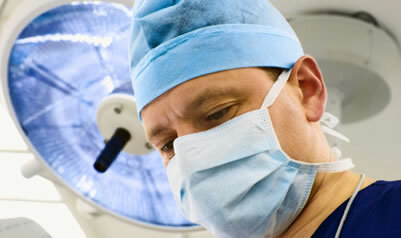 You will have your PICC inserted in the operating theatre under local anaesthetic. The procedure usually takes about 15 minutes. First I will examine the veins in your arm with an ultrasound machine to make sure they are suitable - you will have a tourniquet on your arm during this stage. Once I have identified a suitable vein, I will clean your skin with antiseptic solution and numb the skin with local anaesthetic. I will then insert a needle and wire into the vein whilst watching with the ultrasound. I will then thread the PICC into the vein and check the position with an X-ray; this is usually done whilst you are in the operating theatre. The PICC will be held securely in place with a dressing, you will not require any stitches. If your veins are small, it may be difficult to put the PICC in. Sometimes it can be difficult to thread the PICC up the vein towards the heart. If this happens, it is possible to try again using a different vein. When the line is not being used there is a slight risk that it may become blocked. To prevent this, a small amount of fluid is flushed into the line using a syringe; this is usually done once a week.The dressing will also need to be changed each week to reduce the risk of infection. As it is difficult to do this yourself with one hand, the nurses at the hospital may do it for you or arrange for a nurse to visit you at home. A partner, relative or friend can also be taught to do this if they feel happy to. When you are showering we recommend that you wrap your upper arm with cling film to prevent the PICC from getting wet. You should not bath with a PICC in. How the is PICC removed? When you no longer need a PICC it will be taken out. A nurse will usually do this for you and it is a painless procedure that only takes a few seconds.